"What if I ran CTA for one day?" Also I would have new Green Line Stations at Damen/Lake and Western/Lake and new Pink Line stations at Madison and Roosevelt. Anyway, what do you guys think? And also explain what would you guys do if you ran CTA for one day. The Express routes would be restored across the board that were taken away from the service cuts in the past. Buses would be evenly distributed throughout the garages so no garage has all new/old equipment(yes, that mean 77th better love some Novas, because they're getting some back, and Forest Glen will get a share of the New Flyers). The articulated buses will be spread as even as possible through the artic-capable garages. Chicago will have about 10 artics on it's roster and Forest Glen will have about 10 artics as well. The #11 Lincoln route will be restored fully, connecting between Fullerton and Western once again. Blue & Red Line service will be kept clean by having a CTA Tact & React Squad on each train(2 off-duty CPD Officers in plain clothes and 2 CTA Maintenance members per train). Their jobs will be to enforce departing the train at the end of the line(s)(CPD) and cleaning up any bodily messes immediately(Maintenance). If someone urinates/defecates on the trains, the Off-Duty CPD radio in for a squad, detain the offender and have him/her arrested for Public Urination/Defecation. Rail Yards will have Security Guards on site with K-9's to keep taggers out. I totally agree with you sw4400. There never was an X14. That route was simply 14 Jeffery Express. But whatever the route number actually was this route is totally unnecessary because it exist as the J14 Jeffery Jump with the only real difference being stops south of 67th are essentially every half mile instead of the former every two blocks at primarily the odd numbered streets. Those stops no longer served by the express are still served by the 15 Jeffery Local, which still makes a Jeffery Express unnecessary. I'm not so sure about the X20 you proposed because of the previous version labeled Washington/Madison Express and failed it eventually wasn't much of an express with the decision make all the stops on the Madison portion local and continually adding of more stops on the Washington portion which basically made even more obvious that the previous X20 was essentially a resurrection of the old 131 which failed 20 years prior. The one merit it seems to have is the implication from this version's name that you avoid any Washington Boulevard routing except in the downtown area because of Madison being one way there. Take some other steps further keeping it from being a resurrection of 131 like tweaking the service hours and structuring it as a true limited stop express service without the nonsense of more than half the route being local, and you got something. I am curious as to your motivation for X29 and X66. I think the 66 proves that Chicago needs more than just 10 artics as you're proposing, and Forest Glen would have to not only get maintenance hoists suitable for current 60 foot length artics, but its whole layout in how buses are parked would have to be completely reworked. CTA5750 pointed out early on in the garage remodel discussion that even if FG had up to date hoists, its current layout barely leaves room to store 40 foot standard buses and storage of even 10 artics would be nearly impossible. Your other ideas though, I think are workable without too much change or hitting too many bumps. Disclaimer: These are my ideas for fun, so I'd prefer constructive criticism. Distance based fares for the L: Maybe it will be better for some people, maybe not. I think a simple trial will tell. NOT like Metra though. More like station to station. Ventra without the Ventra crap. I don't think this needs an explanation. 7000 Series: Accelerate the design and delivery and bid from Japanese companies. Buses: Have a common fleet (New Flyer or other), to make maintenance and training better. Make all L stations accessible. More services for riders. Have the CTA think of it this way: We're a customer service company that happens to run public transportation. If I ran CTA, the first thing I would do is fire Frosty the Claypool, and all his Stroger cronies, and whoever is the driving force behind More Bus Moves, and get my relatives jobs. Then I would just fire all the consultants and start digging the Halsted subway from 99th to 127th. The money's gotta be somewhere after 45 years. Then I would call in T.J. Ross and say that he is the only one competent to run this thing. At least the only one not to show his incompetence. I might do art's L via the Skyway to South Chicago. I would also extend the Orange Line to St. Rita. I'd also give all buses 6 digit fleet numbers. Then I'll have TJ integrate CTA and Pace bus routes, so as to eliminate abominations caused by CTA bad planning being inflicted on Pace, such as 385 and 422. You All Are Doing It, So I'm Gonna Have A Go At This.. 1.) First, I Must Agree On TripleTransit1 Idea To Restore The Express Routes That Were Discontinued. There Was Never An X14 Route, Only The #14 Route So I Won't Go On That. Plus Don't Really Agree On The X20. But All The Other Routes Should Come Back, & I Am Interested To Hear More On The Idea On The X29 & X66 Routes. But You Forget About The X80 Irving Pk Exp, X54 Cicero Exp, & X28 Stony Island Exp, Which I Think The CTA Could Have Just Added Limited Stops Along Stony Island Ave, Instead Of Combining Service With The #28 Local. 2.) I Would Do Some More Studying On Trying To Find A Way To Restore A New 31st Street Bus Route That Could Operate Between Cicero & The LakeFront Or Perhaps The Mercy Hospital. Either That Or Restore The Old East & West 31st Routings, Having The East Route Operate via Ashland (Orange Line), Archer, Lock, 31st, Wentworth/LaSalle, 35th, State, 31st, King Dr, Between Mercy Hospital And/Or The Lakefront, & The Ashland Orange Line Station, Serving Red And Green Lines On 35th. West Route Would Operate Between Cicero/24th Pl Or Cermak/Kenton Where 54B Terminates, and 35th/Archer Orange Line Station via Cicero, 31st, Western, 35th, & Leavitt (Orange Line). Its One Of Those Options. -49B North Western Changed To #49B N. Western/Asbury And Extend North To Davis Purple Line On Weekdays, Plus End Some AM Rush Trips At Berwyn & Continue South To 79th As #49 Western. -All Stations Between Howard & Linden Made Accessible. -Add Weekday Midday Service For Certain Trips To Run Purple Line Express Service Between Linden & Downtown. -Reconstruction On California Station (O'Hare Branch) To Open Auxiliary Entrance On Fullerton Ave.
-Make All Stop On Forest Park Branch Accessible (Since Just About All Them Have Ramps). -Reopen Central, & California Stations. -Close Thorndale Station & Open Up Glenlake Ave. Auxiliary Entrance/Exit At Granville Station. 1.) Discontinued Ventra And Return To Original Payment Methods. 2.) Add More Articulated Buses To Routes With High Ridership. 3.) Move Some Articulated Buses To 74th & Forest Glen To Accomodate Routes Within Those Garage That Could Use Them. I'm Done. What Your Opinions On This? Share Your Thoughts & Ideas. To better understand your idea on the L operations side, could you explain more how your particular distance fare policy would work? And I understand the maintenance side of a more monotonous fleet, but I think manufacturers knowing that their product won't be the only model on a TA's fleet keeps them competitively on their toes and from falling into complacency due to holding a monopoly on any one city's transit bus fleet. Knowing their model is always going to get chosen because various large TAs keep coming only to them just leaves too much room for lack of motivation to continually improve on their work. I would also argue that it leaves maintenance crews' with stagnating skills because they fall into only knowing how to repair just one manufacturer's bus model for long stretches of time given the 12 year bus life standard as most of the time federal funds are used to buy new buses. I would immediately change the wretched seat layout on the 5000s & fire every single person that approved it! I would also change the seats on all the 4000 artics to all forward facing wherever possible. The Purple Express would become an all day operation, but it would use the subway & flip back at Roosevelt using the old tunnel portal. I would sue the consultants that approved Ventra. All that was needed was to find a new supplier of RFI chips for the Chicago Card. I would purchase the St. Charles Airline right of way from the L east to the IC Mainline, so that direct L service from the Loop to the Museum Campus, McCormick Place & Soldier Field could be done. The CN wants to abandon the Airline, which would be criminal. I would extend the 50 Damen, north to Clark/Devon. The X9 would also go to Clark/Devon. The 53 Pulaski would go to Devon Kedzie. The only reason it doesn't is because the Surface Lines Co., didn't want the streetcar line having a grade crossing at Granville over the C&NW's Mayfair cutoff. I would charge a full adult fare for all large strollers that don't fold up. The stop marks for 4 & 6 car trains at Clinton/Lake are in a ridiculous location. Move them so the middle of the trains are at the stairs. Reopen the east side stairs at Loyola. Build the south entrance to Granville at Glenlake & get rid of Thorndale already. If I ran the CTA for a day and I truly cared about Chicago area transit as much if not more than previous area transit heads have professed, the first thing and central idea I would focus a lot of my energy on is advocating true integration of the transit systems here as a whole beyond the current mess we have with having four service boards even if that likely meant my job disappears. And I would push for that new structure to be truly independent from the state, county and local politicians so we wouldn't be having transit improvement projects held up for decades, disparate fare systems that work against riders or all these petty fights of bus routes from either the bus services crossing city limit lines being an encroachment on each other's territory when the reality is residents living close to those lines get a somewhat seamless commute. All the above is presently because of the constant infighting fueled by idiotic nonsense of the city accusing the burbs not doing their fair share and the equally idiotic sniping from the burbs a similar accusation at the city with said politicians just fanning the flames for their own political benefit and at the detriment of the area's transit riders. 1. First probably what I would do is can BRT and put all the money that's being invested into that into a major X route expansion. 2. I would expand that as much as possible using the #X80, more buses express less buses local as a model of my X routes. 3. I would also join routes together like run some #X49's to Howard, some to Berwyn and eliminate the #49B. 4. I would do like SW4400 says bring NF's back to Forest Glen and Novas to 77th. 5. I would put artics at Forest Glen if it means I would need to expand the garage to do that. 6. I would try to put artics at all the remaining garages. 7. I would order more artics because ridership is expanding on many routes that could use the extra capacity. 8. I would order more hybrids and all electric vehicles. 1. I would take the junk off the blue line and give it some newer cars. I would retrofit bustracker and flight info into the railcars. 2. Bring back skip stop service and put the X minutes to loop signs back up at the stations. 3. I would try to get my legislators to impose a tax on the automobile users in an effort to financially build my own expansions without the need for AA studies. 4. I would build electric fences all around rail yards in an effort to keep the bad guys out. Maybe keep the voltage low enough to not kill but injure with prolonged exposure. 1. eliminate all LSD express buses and build a LRT service along the lakefront. 2. Bring back PCC trolley cars on a limited scale downtown. and one other thing I would build a transit museum similar to what NY does in the Chicago city limits. Maybe even lease out historic equipment to film studios, as long as they bring it back. "Excuse me, I want a seat." "You want a seat? $2.00 extra!!!" "Everyone in front of me got a seat." "You want a seat? $3.00!!!" "No CTA for you!!! Come back one year!!!" They'll have to have tasers. Dominick's had Soup Nazi Soup, but I haven't seen it since. Of course, it was under its correct brand name. The three such systems I have ridden in the US [PATCO,WMATA,and BART] all seem to have better equipment IMHO. Additionally, I would say they might be more suburban oriented than the L.
I think you'd have a hard time pulling it off without a major upgrade. The problem is the one highlighted by the story mentioned a couple of days ago about the London guy who didn't tap in and was charged the default fare of £7.20 instead of the correct fare from his suburban location of £24.50. While that apparently was a suburban situation, the only way CTA in the past enforced zone fares was to have sufficient conductors to check people crossing over fare zones, the last instance being the express fare for using the Purple Line between Howard and Belmont. Similarly, CTA was able to enforce express surcharges if boarding an express bus downtown. However, that was in the days of cash fares and paper express checks. To the extent that CTA has abolished conductors and is insisting on payment by Ventra or RFID card (mandatory on the rapid transit, even if it is the $3 Ventra ticket), the only possible way is if it could enforce tap off. It is bad enough trying to get through the turnstile one way; imagine the mess if you had to wait for the Ventra reader exiting, too. Update: Also, recalling a suggestion that Metra should use something like I-Pass gantries, the later revelation that Ventra charged whatever card it found in a wallet sort of nixes the idea of not needing to tap out. I also think that the security cameras are too busy tracking perps to trace the distance each legitimate passenger is traveling too, although I suppose that is technically possible, at least in London. It also would violate federal procurement requirements, which require a solicitation or latching onto a prior competitive solicitation (such as obtaining options). In effect, you had something like that in the age of the New Looks, with essentially GM calling the shots, but licensing its technology to Flxible to avoid an antitrust charge. And despite all the Roger Rabbit conspiracy charges, not even GM could afford to stay in the bus business by the late 1980s. I love PCCs but I wonder if there are enough in existence that can be brought into operable condition. One would bet that whatever still exist are somewhere like SF or Kenosha in similar historical use. If one were to be like Bill Lipnski, and for instance, suggest digging up a street to see if the trolley tracks are still there and usable, I think one would have to go the route of New Orleans, and eventually get some replicas. Of course, N.O. was trying to reconstruct something from the 20s, as opposed to the 40s. That's true about the buses. And besides, I like Novas too, so let's keep it a mixed fleet then. The distance based fare would be on station to station rides. The fare card machines would be programmed to know what starting station you're at, and then would give fare information about the station you're going to. The cards would still be magnetic strip stored value cards, so you could put in multiple rides if you know you'll need them. The existing turnstiles would be modified to have an additional card slot facing the paid area as well, which would actually deduct the fare in addition to unlocking the turnstile (sticking the card in when you're entering the paid area only unlocks the turnstile). 1.) 77th would get a total makeover. 3.) All express routes would be brought back into service. 4.) Bus lanes would be added on all routes. 6.) An equal amount of Artics would be given to all garages. 7.) Route 95W would be extended to Chicago Ridge Mall. 10.) Route 67 would become a single route and would stay on 67th traveling west until it would end at Ford City Mall, Route 69 would Start at the 69th red line station and would transition to 71st Street and continue service heading west until Pulaski and then heading south on Pulaski towards K-Mart where it would end service. Since the Crowd Reduction proposal, essentially no point, since CTA abandoned half of 95W trips to Pace 381. 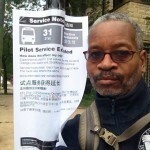 Now, if you want to get on my bus that CTA be abolished, and one 95th route exist, which goes out to Moraine Valley College, that's a different issue. ...The fare card machines would be programmed to know what starting station you're at, and then would give fare information about the station you're going to. The cards would still be magnetic strip stored value cards, so you could put in multiple rides if you know you'll need them. The existing turnstiles would be modified to have an additional card slot facing the paid area as well, which would actually deduct the fare in addition to unlocking the turnstile (sticking the card in when you're entering the paid area only unlocks the turnstile). Since obviously CTA is doing away with all magnetic stripe cards, your proposal is fantasy. Also, you would have to deal with that most riders now are on some sort of passes (like 30 day ones) and you would have to have a means of pricing the passes based on whether the riders were just commuting 22 days a month between home and work, or riding all over the CTA (and probably Pace) service area (just like Metra monthlies are zoned). What you suggest is essentially what was on the Illinois Central starting about 1970, but which Metra eventually yanked out of the Electric District stations. Even at that you could defeat it by telling whoever at central control was spying over the station by saying "look I have a ticket, but the stripe must have gone bad." If the IC could have figured this out maybe 45 years ago, I suppose that CTA could have while it was still under competent management. Of course, not today. Reading some of these ideas, all I can say is that I'm glad you're not running CTA. I'd be curious where the money for all these service expansions and adding more staff to trains would come from. If your answer is "fire all the incompetent management," well even if we assume that all the management is incompetent and you save 100% of their salaries, that still gets you maybe a week or two of service. Then what? Plus, you'd still need managers to implement the ideas and oversee the employees doing the work, and those managers will have to get paid. So, really, not saving any money. If I were in charge of CTA (and assuming capital money wasn't a problem, and politics were based on logic and what's best for the community rather than keeping certain folks in power), the biggest thing I'd change is the bus control and communications system, implement a working radio system so they're not dependent on drivers' cell phones, and make the bus controllers and street supervisors part of the same job classification. The technology would be integrated so the driver doesn't need to log onto 342 different devices every time he gets on a bus. Next, I'd permanently cancel the ridiculous plans for the Yellow Line extension and Orange Line extension, and focus any future rail development plans into areas where there can be a payoff through reducing excessive amounts of bus service (i.e. 95th Street, Lake Shore Drive/Michigan Avenue). Every time you build a new rail line (or L station), you are basically committing to operating that service/staffing that station 18-24 hours/day, seven days per week for the next several decades. Plus, there will be an increase in maintenance costs, which increases staffing requirements, management requirements, storage requirements, etc. That's a lot of money, and if the only benefit is you get to replace a handful of buses running every 20-30 minutes at fairly light loads, it's simply not worth it (the Yellow Line extension basically competes with the 54A and 97, neither of which carry much in the way of passengers). I'd also give all of Evanston bus service to Pace, except any places where through-routing makes sense (such as the 93). I'd finally make an Archer Garage replacement, at Western & the Orange Line (I don't know what the plan is for the land there, but it would be a great location for convenient driver reliefs from Midway all the way to downtown). I'd also make that the replacement for 74th Garage, and turn the current 74th Garage into the new South Shops facility (to not waste what's still a fairly new facility). 74th is simply too poorly located as an operating garage. Then South Shops and 77th could be rebuilt into a new 77th garage. If I could turn back the clock a few years, I'd also build a garage at the land near Wilson/Broadway that's now a Target. This would replace North Park (and possibly part of Forest Glen) reducing CTA's dependence on outdoor garages, while having a garage closer to Lake Shore Drive (and on a rail line), again making for more efficient operator reliefs and reduced deadheading to/from locations where a large portion of the service operates. Those are all things that have major impacts on the financial efficiency and operational reliability of the system, even though they are largely invisible to the passenger (other than the rail expansion plans). What I wouldn't do is worry about inane things like making sure each garage has an equal number of whatever type of bus, which is really just an arbitrary thing that has no basis in operational sense. I'd leave that up to qualified operations and maintenace managers and planners (who might have to be hired from elsewhere), and if they determine that it makes sense to make one garage all-artic, and swap a few buses between other garages every now and then to keep other operational efficiencies, then so be it. In the grand scheme of things, it costs far less than deadheading buses halfway across town or making drivers take the 9 to the 79 to make a relief because the garage isn't located on a corridor with direct service or through streets to where you're trying to go. Another thing that would be interesting would be like NYC does, when you have buses bunched up you make the late buses run express just like the "L" and put those riders on the follower. Short turning may be nice to regain schedule but what happens is you penalize every rider past the short turn that has to wait double time for the same bus. What also happens by shorturning is you just make the follower late because he has to pick up double passengers.